Both Swansea University and Singleton Hospital are within walking distance, along with Singleton Park, Wales National Pool and Mumbles Promenade. The home is accessed via a private road with meandering driveway up to the house with ample parking and out buildings. There is a trickling stream that runs along the perimeter of the grounds adding to the idyllic nature of the property. The vendors have thoughtfully planted the gardens with a colourful array of plants, shrubs and fragrant blooms offering year round colour along with mature trees including apple and plum trees. There are many interesting features at Ty Nant and the original front porch is one of them. The quintessential climbing wisteria adds to the instant appeal and with the original floor tiles intact and room to sit comfortably soaking up the views ahead, proving to be a cherished spot for all the family. As you enter the home you can immediately appreciate the features that are typical of the Victorian era, including high ceilings, deep skirting boards, stained glass windows, coving and picture rails. The house is generous offering a great deal flexibility with the kitchen and two receptions situated to enjoy the impressive garden and sea views. The kitchen is light and airy with wood floors, fitted wall and base units, Aga with additional oven and hob. The sizable window floods the kitchen with natural light and offers charming garden views. The lounge has the pleasure of a wood burner, picture rail, coving and ample book shelving, with a door to a useful storage room. There is a large window overlooking the garden with sea views in the distance. There is a further versatile room which is currently utilised as a second kitchen/breakfast room and is again generous, light and airy with French doors leading onto the terrace connecting the home and the gardens beautifully. Also situated to the ground floor there is a large rear porch with tiled floor and pitched roof, a generous storage room, walk in pantry, utility which is plumbed for laundry appliances, study and ground floor shower room. 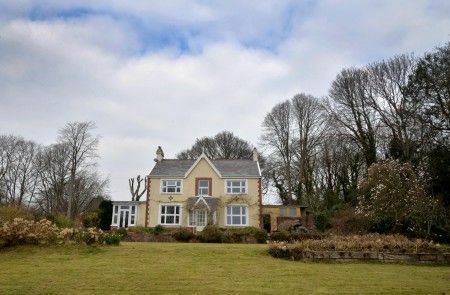 To the first floor there are five bedrooms, a dressing room and family bathroom with separate shower cubicle and W.C.There is a split landing and three of the bedrooms are situated to enjoy the hypnotic garden and sea views that stretch out as far as Mumbles lighthouse. The master bedroom is spacious with original fireplace and the added pleasure of a dressing room with ample built in wardrobes. The home sits within a very large plot with a generous array of mature trees and an excellent degree privacy. There is planning permission in place to build a detached four bedroom home which sits sympathetically within the landscape and offers a contemporary dwelling which benefits from a garage, coast views and a surprising amount of privacy. There is so much to love at Ty Nant ensuring it will appeal to most.